Early in the year Greg Merrill discussed the current administration's decision to shut down the Keystone pipeline project and the issues surrounding that policy. That was obviously not the end of the story. If there is a need, the energy industry will find a way. In recent years the various natural gas shale projects have changed the configuration of natural gas delivery in the US. That means some of the traditional routes used to transport natural gas to a number of areas - some over long distances - are no longer economical. And now a number of these gas lines could be modified to transport crude, sometimes in the opposite direction. JPMorgan: - Given the regulatory challenges facing the construction of some new oil pipelines in North America, many companies are turning to converting existing assets to oil service. With natural gas supplies growing in numerous regions from shale plays such as the Marcellus, gas pipelines delivering along historical routes into these regions are becoming underutilized, providing options for conversion to transport crude oil. At least four gas lines are under discussion for conversion into oil service that could move oil out of Canada, the US Gulf Coast, and upper Midwest areas. One of the pipes making up TransCanada’s Mainline gas network that runs from western Canada to the eastern border is under consideration for conversion to crude oil, which could reportedly deliver 0.5 to 1.0 mb into Padd 1 and eastern Canadian refineries. 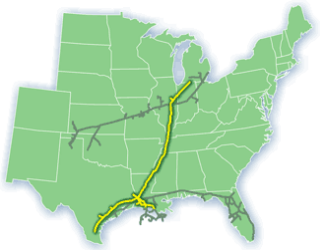 Additionally, Energy Transfer Partners has petitioned the US Federal Energy Regulatory Commission to repurpose the Trunkline natural gas line into crude service and reverse the direction to run south from the upper US Midwest into the Gulf Coast. The Pony Express line originating in Wyoming completed an open season for deliveries of approximately 230 kbd of crude into Oklahoma in 3Q2014 after being in gas service since 1997. Lastly, parts of the underutilized El Paso Natural Gas (EPNG) pipeline system are being considered for conversion to transport an estimated 400 kbd of crude to southern California refineries from west Texas. Here is an example. The Trunkline gas line, developed to deliver natural gas from the Gulf Coast to the Midwest is no longer economical because these customers (in most cases) can get gas from nearby shale sources. Panhandle Energy: - Trunkline Gas Company operates a 3,059-mile pipeline system with access to Gulf Coast supply sources which can deliver 1.5 Bcf/d of natural gas to Midwest and East Coast markets. Our Midwest customer base includes some of the nation's largest utility and industrial gas users in Chicago, Michigan, Memphis and St. Louis. The line doesn't follow the proposed Keystone path exactly, but it could get crude to the Gulf Coast nevertheless. And that's the idea - just move oil in the opposite direction. Of course just like Keystone, these projects are also going to face a great deal of opposition. Petroleum News: - Operating in the shadows, Energy Transfer Partners, ETP, is trying to gain an edge over others — notably TransCanada and the partnership of Enbridge and Enterprise Products Partners, EPP — to offer pipeline access from the Bakken, Alberta oil sands and the Utica shale plays to Gulf Coast refineries. Industry sources say its plan is pinned on reversing its 770-mile Trunkline system to a southbound operation from the Midcontinent, shifting from the declining natural gas business to the shale-rich core of the United States and beyond to Alberta. They are projecting that the switch to a Gulf-bound crude pipeline could expand Trunkline’s capacity to 400,000 barrels per day from 150,000 bpd. Although ETP has kept tight-lipped about its plans, the proposal was dragged into the public spotlight through a motion to “intervene and protest” by Michigan Gov. Rick Snyder filed with the Federal Energy Regulatory Commission. Snyder said the proposal to convert a “key piece of the natural gas infrastructure” in Michigan into an oil pipeline “will not serve Michigan’s energy needs” to heat homes and businesses in a large part of the state. One way or another the industry will find ways to get crude to the Gulf. As it does so, the US job market should benefit - as it did in Canada - with multiple businesses springing up to support these projects.